Festival ticket for all concert days Thursday to Saturday inclusive. Includes access to camping. Campsites sold separately. Must have a Weekend Pass purchased or in your cart to purchase campsite. Limit of 1 campsite per Weekend Pass purchased (eg. if you want 2 campsites you need to purchase 2 Weekend Passes). Please add your Weekend Passes to your cart before you purchase Campsites. Everyone who camps must have a valid Weekend Pass. If you are purchasing a campsite after your original purchase, please be sure to log-in first so we can verify your past order history. To reserve your campsites, click on the site/sites you want, add them to your cart, and proceed to check-out (you have 15 minutes to check out, otherwise your campsites will be released). You need minimum 1 Weekend pass per campsite. No transfer will be permitted at this time. Only one camping type (RV, Trailer, Tent) and vehicle permitted on each campsite. Please add your Weekend Passes to your cart before you purchase Campsites. Campsites require the purchase of a Weekend Pass. If you are purchasing additional campsites after your original purchase, please be sure to log-in first so we can verify your past order history. EVENT: CELEBRATING 11 YEARS OF MUSIC IN THE FIELDS! 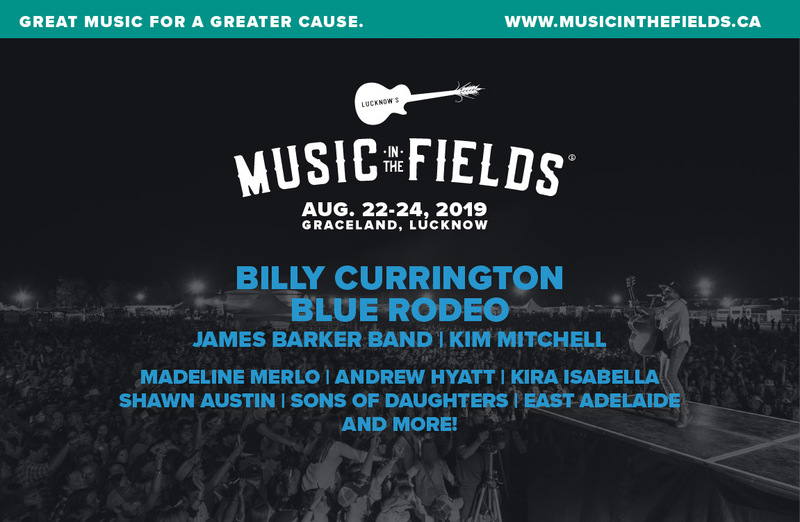 Lucknow's Music in the Fields is an exciting 3 day country music festival and camping event tailored for friends and family in authentic, small-town, rural Ontario. 100% of all proceeds are donated to the on-going fight against Cystic Fibrosis and to fund organizations and charities in our community. Celebrating our exciting 10th year of music, camping & fun, we bring a unique experience with original country flair. JOIN US TO CELEBRATE A DECADE OF MUSIC IN THE FIELDS! Please note: Camping layout and rules have changed with respect to site selection and re-entry. Please read all of the new descriptions and rules. Visit www.musicinthefields.ca for all the latest information, rules, and updates for 2019. Single Day SATURDAY ONLY passes MAY be available August 1, 2019, IF the event has not sold out by then. Ticket price for the single day will be $155.88+HST and service fees. Kids under 9 years old are free! Event is Rain or Shine. No Refunds or Exchanges on tickets or camping. All Sales Final. Subject to change without notice. Artists and schedule are subject to change. Tickets are purchased for the festival not individual artists. Cutoff is Thursday, August 22, 2019 9:59 am EST unless it sells out earlier.